In this wonderful medium we cherish often there are comics that do not get the press they truly deserve and fly under the radar. Black Lightning: Year One is one of those gems. This book is great. Black Lightning is one of DC Comics's best super-heroes. Created by comics great Tony Isabella and Trevor Von Eeden in 1977, Black Lightning was DC’s first African American super-hero to star in his own book. But maintaining a comic has not been easy. He was cancelled, twice, but the hero has a pretty good following and has moderate (solo outings in Detective and World's Finest) to great success (Batman and the Outsiders, Justice League) over the years. Sure, with the name “Black Lightning,” sometimes the first thing that comes to mind is the “blaxploitation” of comics in the 1970s. Back then the criteria for being a “black hero” was either being mad at everybody, or having “Black” in your super-hero name (having a giant afro was also a necessity). Thankfully Black Lightning evolved beyond that. Realistically, Black Lightning is more Alexander Scott (actor Bill Cosby’s character in the legendary TV show I Spy) than he ever was Luke Cage. Over the years superb writing from Tony Isabella (especially in Black Lightning's second series), Mike W. Barr in the pages of Batman and the Outsiders, and the much missed Dwayne McDuffie in Justice League, kept Black Lightning a fan favorite. So now we come to Black Lightning: Year One, a six-issue miniseries published in 2009 and released in trade the same year. As the title implies, it tells the story of the first year of super-hero Black Lightning, aka teacher/principal Jefferson Pierce. We first see the Pierce family: Jeff, wife Lynn, and daughter Annisa, who return to Jeff's hometown of Southside, a section in the city of Metropolis (home to you-know-who). Jeff is the new principal at Garfield High School in Southside. Unfortunately, Southside is now known as Suicide Slum, and is practically that. Thanks to a powerful criminal organization called The 100, hope is all but gone in Southside. All Jeff wanted was to teach school, but the brutal murder of one of his students by the 100 changed that. Now Jeff takes the fight to the 100, going by the name Black Lightning (using his latent bio-electrical powers and Olympic level fighting prowess). Along the way he gives the neighborhood the symbol of hope it desperately needed. This is Jeff’s story, and brother, it’s a good one. 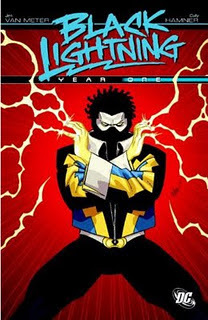 Black Lightning: Year One was written by Jen Van Meter (JSA Classified, JSA All-Stars) and drawn by Cully Hamner (Green Lantern: Mosiac, Blue Beetle) Van Meter not only did her homework and respected Mr. Isabella’s treasured creation but she put her own contemporary spin on Lightning’s history. She has each chapter narrated by the cast. This was a nice touch as we see through the eyes of others the effect Black Lightning's actions have on the neighborhood and themselves. The book’s excellent writing is only matched by the art. I became a fan of Cully Hamner’s art since his days on Green Lantern: Mosiac (now there’s a series that belongs in trade [seconded! -- ed]) and he has only improved. And the art is superbly colored by Laura Martin. It has a slick, polished feel that never sacrifices the urban edge. Hamner even updates Black Lightning’s classic 1970s disco look with twenty-first century sensibilities. The update of Black Lightning's mask from the “afro cowl” he first wore to hide his identity, to a more practical rubber mask/hairpiece was a great idea. And Black Lightning's jacket is seriously cool. One of the series’ strengths is the supporting cast, and it’s here Van Meter gives us some terrific characterization. From matriarch Mrs. Pierce, sister Constance, brother-in-law Frank, cute-as-a-button daughter Annisa, devoted wife Lynn, and family friend (and tech expert) Peter Gambi, Jeff’s family is loving, caring, and supportive. Instead of the clichéd “my loved ones must never know,” Jeff’s family knows about his super-heroics practically from the beginning. And we find out why Jeff chose the name “Black Lightning.” I loved seeing the family discuss Jeff’s extracurricular activities at the dinner table. Since Suicide Slum is in Metropolis it was only a matter of time before a certain Man of Steel showed up. We first see reporter Clark Kent as he spends a day with Jeff at school (Clark using his powers to size up Jeff was a nice touch). Through the course of the series we see a true friendship form, not between Black Lightning and Superman, but Jeff Pierce and Clark Kent. In fact, Clark is more an ally to Black Lightning (and the Pierce family) than Superman. We even get a sweet take on “It’s a bird, it’s a plane” between Clark and Annisa. I’m glad they addressed why Superman never shows up to help in Suicide Slum. From appearances it looks like Superman doesn’t want to deal with helping fight crime in a majority black neighborhood (something I would never believe). But we learn that his powers were impaired due to magic in the area. Along with Kent we see Lois Lane (channeling TV’s best Lois, Phyllis Coates) and Police Lieutenant Bill Henderson. Henderson was a stable in the 1940s Superman radio series and the 1950s The Adventures of Superman TV show. Isabella used Henderson in Lightning’s first series and I’m glad Van Meter decided to bring him back. Black Lightning: Year One shows that one man can make a difference. 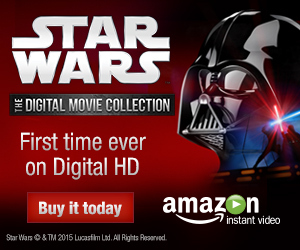 From the classroom to the streets, we see the journey of a true hero. It tells the story of a man who re-energizes his students and neighborhood’s sense of pride within themselves. Isabella and Von Eeden created a hero. Van Meter and Hamner reminds us why. What we have is a very enjoyable book. Well done. That was a great review for a very great and underrated miniseries.I am glad to see that I am not the only one bought the trade and loved it.The only negative to it was that since it came out I have had my fingers crossed for DC to announce an ongoing that takes place in the present day with same creative team. I bought this mini-series when it was first released and enjoyed it. It made me appreciate the character more when he turned up in other places (JLA, Final Crisis).